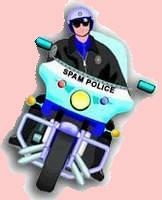 In an earlier weblog I told you how much time it took me to report all the spam I received to Spamcop. On average, it took me about two hours a week to report all the spam to Spamcop. Strange enough, Spamcop kept repeating "If you like this service, please pay for it." Did I like this service? You must be kidding! I hated it. Would there be anybody who likes reporting a hundred and fifty weekly spam mails? But I considered it my duty to help ridding the Internet of the vermin that every Internet user hates. But today, while I was reporting spam to spamcop, I got the following warning "Please wait for twenty seconds -- or subscribe to Spamcop." Thank you, Spamcop, this was the straw that broke the camel's back. Why should the people who do the work have to pay for it as well? From now on, I'll have two extra hours of spare time a week.